The new Sailability Centre at Fairway Bay, Gulf Harbour, New Zealand was opened officially on Saturday January 31 by Rodney MP Mark Mitchell and his wife Peggy. Funds raised by the local Rotary Club of Whangaparaoa at a charity dinner and auction in November, with guest speaker Harold Bennett of America’s Cup fame, plus additional support from two BBQ sausage sizzles at PAK’nSAVE Silverdale, have provided the personnel “C-crane” and one of the brand new Hansa 303 wide boats that are two of the essential elements of the new Sailability Centre. Sailability Auckland Chairman Brendan Tourelle and New Zealand 2012 Paralympian Tim Dempsey, also of Sailability, made the opening remarks and thanked everyone who made this exciting new venture possible. As well as the support provided by the Rotary Club of Whangaparaoa, additional support has been received from The Halberg Disability Sport Foundation, the June Grey Charitable Trust, Rotary International District 9910, plus significant support from Fairway Bay and the Gulf Harbour Yacht Club. “We also acknowledge with thanks the fantastic contribution of PAK’nSAVE Silverdale in hosting two very successful BBQ events for Sailability”, said Mr Tourelle. Local MP Mark Mitchell then extended the official welcome to everyone and acknowledged the huge efforts made by Sailability Auckland, Rotary Whangaparaoa, Fairway Bay, Gulf Harbour Yacht Club and the Halberg Disability Sport Foundation. “Without the excellent and very effective work that was done by all the participants in this venture, especially the support from local businesses, we would not all be celebrating success here today”, he said. Commodore John Weston of Gulf Harbour Yacht Club welcomed the new facility that will provide safe sailing for persons with disabilities and which, with the unstinting support of Fairway Bay, is ensured a sustainable and exciting future. In a lively opening ceremony attended by over 20 Rotarians and more than 50 other enthusiastic supporters, Mrs Mitchell christened the first two boats with champagne – with both boats appropriately echoing the blue and yellow colours of Rotary. First to set sail in the blue boat were Jan Apel, 2012 Paralympian sailor, accompanying Roy Bartlett who had not sailed for many years and who was the first to use the new crane that had been provided by Rotary Whangaparaoa. Roy and Jan were soon followed in the yellow boat by Belinda Edwards who had Sailability instructor Taylor Mitchell crewing with her. 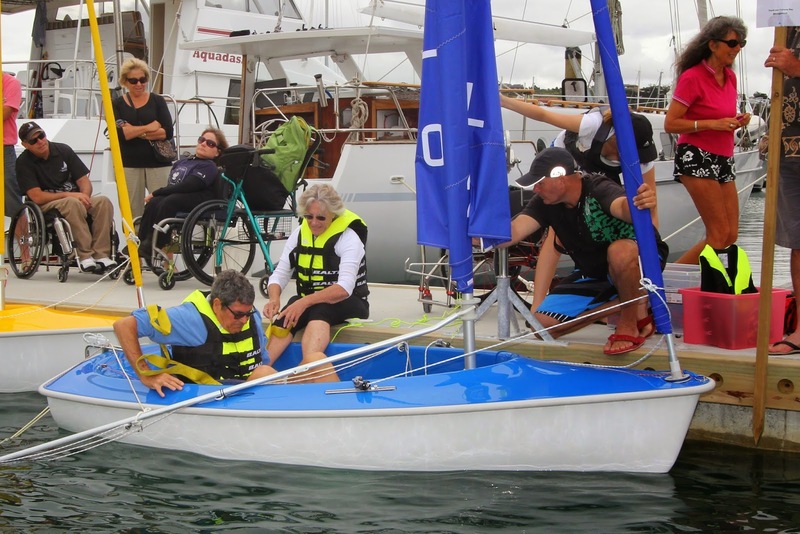 The smiles on the faces of the sailors and spectators alike told the story of a job well done and there was general agreement that Sailability was well and truly launched at Fairway Bay. The Halberg Disability Sport Foundation arranged a major media event at Fairway Bay, on Monday February 9, when New Zealand yachting stars Peter Burling and Blair Tuke supported young people with disabilities getting their first taste of sailing the new boats that were sign-written in time for that event. The children had cerebral palsy and they had a fantastic time! The next event on February 14 and 15 weekend was the first official Sailability Regatta at Fairway Bay, operated by Gulf Harbour Yacht Club. President of Rotary Whangaparaoa Brian Mullan says, “There is indeed much to look forward to at this great new venue for sailors with disabilities. I am so glad that I was able to become involved with Sailability through the Rotary Club of Grantham in the UK and to be inspired by the Rotary involvement there. Supporting Sailability in New Zealand has for the past few years been an ambition of mine – now fulfilled thanks to the great support that Rotary Whangaparaoa received for this great new centre”. Watch the TV ONE News item http://tvnz.co.nz/sailing-news/peter-burling-and-blair-tuke-help-halberg-disability-sport-foundation-video-6231149. It’s great promotion of Rotary making a difference and children enjoying their first sail.